Gateway's introducing two new Core i7 gaming desktops today, and you'd be forgiven for not being able to tell them apart at first glance. The lower-end model is essentially the same rig—but $400 less than its $1700 counterpart. Let's go to the tape: both run on Core i7-860 processors. Both house ATI Radeon HD5850 graphics. Both come with a 1.5TB SATA hard drive, a DVD drive, and WIndows Home 7 Premium. Both have the same impressive array of ports and 7.1 channel audio support. All of that, plus 8GB DDR3 RAM, is pretty terrific for the FX6831-01's $1300 price tag. The higher-end FX6831-03, though, costs $1700 for the exact same set-up plus a Blu-ray drive and 16GB DDR3. And hey, that's still not too shabby! But not quite the steal that the $1300 version looks like, especially given the similarities. IRVINE, Calif., Feb. 3, 2010 – Gateway today announced the addition of new models and features across its line of gaming, multimedia and small form factor PCs. 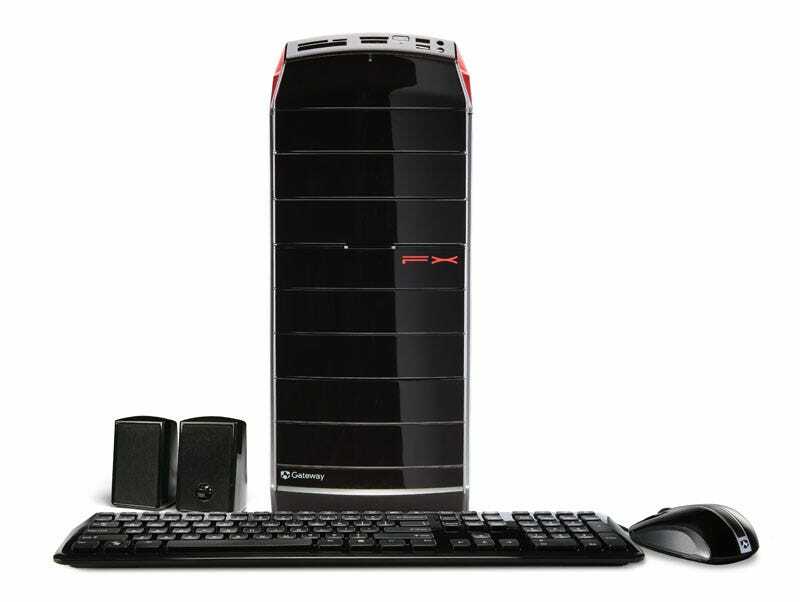 The FX Series of affordable gaming PCs gets a redesign that includes a modernized chassis and new lighting accents. The DX line of multimedia PCs and SX small form factor PCs both now include eco-friendly 1TB drives and powerful Intel Core i5 and i3 Processors, respectively. In addition, the FX and DX now include models with Blu-ray drives. With a newly designed chassis, Gateway's value line of gaming PCs continues to break all the rules, managing to pack more performance and features than ever before into a powerful PC that blows the doors off competitively priced systems. The new design maximizes usability and includes numerous additions that enhance the computing experience. "When it comes to online entertainment, PC gaming and value, Gateway's FX Series can't be beat," said Steve Smith, Gateway desktop product marketing. "While maintaining our price/performance leadership position, the new FX models boast a race car-like design with red accents and lighting, and include several new features that enhance the convenience and use of the PC." The new FX design makes it easy to access and use key features, providing simple and quick access to ports and peripherals. The top front of the PC includes high-def headphone and microphone jacks, while an angled media card reader makes it easy to insert, remove and transfer data from cameras and other devices. This can be especially helpful when the PC is placed under a desk. A handy recessed storage tray on the top of the chassis makes it easy to place cameras, smartphones and MP3 players when downloading files. At the back of this tray, users will find two additional USB ports, which provide convenient connectivity for miscellaneous peripherals. Just behind this recessed area is an enclosed rear compartment which provides a place to store and hide the excess cables from any peripherals placed on the tray. The control dial for the system's adjustable lighting effects can also be found on the top front of the unit, as well as the Photo Frame, stand by and backup buttons. Boasting a 1.5TB drive, FX users will have plenty of room for photos, movies, music libraries and more. Tool-less expansion bays provide additional storage room for growth and backup. A convenient access door on the front of the PC conceals two external hard drive bays, and glides down effortlessly with a slight push on the front latch. Eject buttons for the optical disk drives are also conveniently and seamlessly integrated into the front sides of the PC. Not to be outdone by its user friendly features, both new models in the FX line feature ATI Radeon HD5850 graphics and the Intel® Core™ i7-860 processor with Turbo Boost Technology for killer performance. The FX6831-03 also boasts a Blu-ray drive and 16GB of DDR3 memory, making it a true gaming solution.